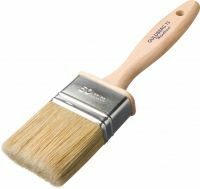 The wooden brush for Tonkin lacquer and linseed oil paints is a flat brush with long bristles and nickel-plated ferrule. It is especially shaped for best colour carrying capacity. This brush lies comfortably in the hand!